Classic Interiors features window treatments from Hunter Douglas, the premier window covering company in the world. Each product category has a price point to meet anyone’s budget. We will help you coordinate colors and select the best products for your window decor and functional needs. 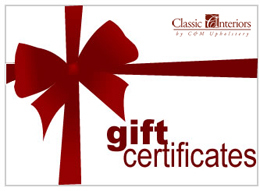 Our professional, certified installers will measure and install your treatments. 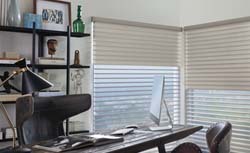 As an exclusive Hunter Douglas Gallery dealer, we offer the premier Hunter Douglas Alustra® Collection. The collection includes shimmering sheers to trendy textures, attractive details and innovative lifting systems. Visualize a world where your window coverings adjust themselves automatically! Program Hunter Douglas window coverings using PowerView® motorization to move your window treatments to the exact position you want and then control and schedule them using the intuitive PowerView App on your smartphone or tablet. You can also operate your PowerView settings using the ultra-modern new PowerView® Pebble® remote control. Complete any window by adding custom beautiful drapery or drapery panels. Use alone or in combination with your current window coverings to add color and interest to a room. Let your imagination run wild, because the options are endless when it comes to fabric, texture and style. Nothing adds a punch of color or style more than a custom cornice, valance, scarf or swag. Change them up seasonally to give your room a new look throughout the year. From traditional to contemporary, custom top treatments will complete any room. Learn more about our other products. Classic Interiors is the premier provider of custom Hunter Douglas window coverings. 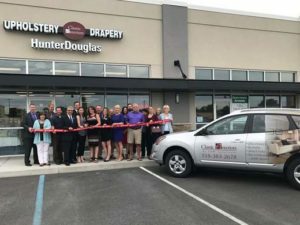 We also offer custom draperies, top treatments, custom bedding, reupholstery and design consultation for residents and businesses in Clifton Park, Halfmoon, Saratoga Springs, Loudonville, Albany, and Mechanicville, NY, and surrounding areas. 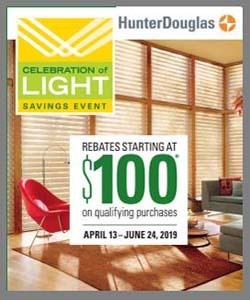 Contact us to learn more about Hunter Douglas window coverings or to schedule a free in-home design consultation today!